Home / Buffalo / CM / diversity and inclusion week / MAC / SAAC / Sports / ub bulls / university at buffalo / UB Athletics celebrate "Diversity and Inclusion Week"
BUFFALO, N.Y. -- The University at Buffalo, and the student-athlete advisory committee (SAAC), hosted several events last week in celebration of the Mid-American Conference's Diversity and Inclusion Week from October 1st to the 5th. On Wednesday, October 3rd in Alumni Arena, the university welcomed Diversity and Inclusion speaker Ekua Mends-Aidoo, who currently serves as an Equity and Inclusion Officer at Evergreen Health. Mends-Aidoo spoke to over 40 students about Diversity and Inclusion as both a life skill and a career skill and how it can be used as a strategic imperative in the working world. To cap off the week on Friday in the Alumni Arena main gym, the SAAC hosted a Diversity and Inclusion Celebration. The event, open to all students at UB, invited students from all over the university to be part of a gathering to celebrate Diversity here at Buffalo. This event featured two guest speakers (Kathy Twist, Buffalo's Senior Women Administrator and Senior Associate AD for Sports Administration, and Devon Patterson, Student-Athlete Advisory Committee President and track & field student-athlete) and led to many new friendships and valuable connections being formed here at the university. The MAC Diversity & Inclusion program, founded in the fall of 2015, provides career educational opportunities for a diverse pool of candidates, career entry and advancement opportunities, consistent support and career mentoring programs for all levels of professionals, and opportunities for collaboration on best hiring practices and cultural enhancements for member institutions. Through this program, the MAC is working to expand opportunities for minority candidates in coaching and administration with six specific and coordinated program initiatives including establishing a Conference Diversity & Inclusion Statement, the commitment of 25 new annual internships across membership, a collaborative mentoring program, a bi-annual summit, the first of which was hosted by the MAC on Feb. 8, 2018, the creation of a resource webpage and the annual awards platform to recognize one institutional athletic department, individual administrator and student-athlete. The successful week carries on the universities strong commitment to diversity and inclusion, in which Buffalo athletics has developed a culture of diversity & inclusion through a variety of programs and was recognized by the NCAA and MAC for its commitment to diversity and inclusion initiatives. 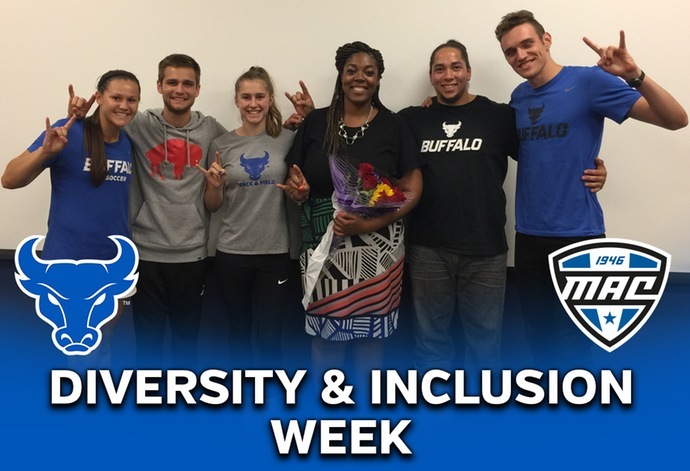 UB was named the winner of the MAC Diversity & Inclusion Institution Award in 2018.